SpiderScribe is an easy to use, web-based mind mapping application with an exclusive integration to 5pm project management software. It gives you the freedom to develop your thoughts and to connect your varying ideas. SpiderScribe also makes it possible for you to share your maps in different ways—online or offline. That is because you can share links to your maps or embed them on your website or blog. Other than that, the application gives you the option to print your maps for physical information dissemination. And when it comes to team collaboration, SpiderScribe has the necessary features as well. It allows you to work with your colleagues on a map simultaneously so you can improve or smoothen plans and concepts together. 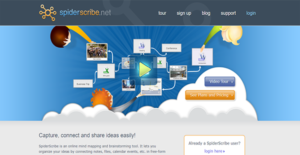 SpiderScribe gives you an environment where you can freely create relationships between your ideas. You can connect your stencils or objects in any way to help you organize different pieces of information cohesively. SpiderScribe goes beyond texts and images. The application lets you add files, calendar events, and geographic locations to your maps. You can even look forward to more types of objects that you can embed in your maps so you can input more kinds of data in a single space. Every aspect of SpiderScribe is customizable. You can tailor your content according to your preferences in color, size, format, and more. This means that you can make your SpiderScribe workspace and map truly your own. With SpiderScribe, you can share your public maps to anyone even when they do not have an account with the platform. This makes it convenient for you to disseminate information and for your recipients to receive them. SpiderScribe has private maps you can share with colleagues so they can work on them too. On top of that, multiple people can open and edit the same map simultaneously, allowing your team to be productive and efficient. As SpiderScribe is a wholly cloud-based mind mapping tool, you do not need to install anything. The only requirements are a modern browser with the latest version of the Flash plugin plus an internet connection. This way, you can view and edit your maps anywhere. Aside from sharing your maps’ links via email, you can also share them on your websites. You can do this by embedding your SpiderScribe maps to your personal or organizational space. More than that, you have the ability to control the size and zoom level for the display. You can do more than clicking and dragging objects across your workspace with SpiderScribe. The application has a drawing mode you can use on your touch-enabled devices to simplify and make mind mapping more fun. If you are interested in SpiderScribe it may also be a good idea to analyze other subcategories of Best Mind Mapping Software listed in our base of SaaS software reviews. Enterprises have different wants and requirements and no software platform can be ideal in such a scenario. It is pointless to try to find a perfect off-the-shelf software system that fulfills all your business wants. The smart thing to do would be to adapt the application for your unique requirements, staff member skill levels, finances, and other elements. For these reasons, do not rush and pay for well-publicized leading solutions. Though these may be widely used, they may not be the best fit for your unique needs. Do your research, investigate each short-listed platform in detail, read a few SpiderScribe reviews, speak to the vendor for explanations, and finally settle for the application that provides what you need. How Much Does SpiderScribe Cost? Disarea LLC offers three enterprise pricing options for its mind mapping tool, SpiderScribe. The packages’ prices and inclusions are listed below to help you decide which one is the most suitable for your needs. We realize that when you make a decision to buy Mind Mapping Software it’s important not only to see how experts evaluate it in their reviews, but also to find out if the real people and companies that buy it are actually satisfied with the product. That’s why we’ve created our behavior-based Customer Satisfaction Algorithm™ that gathers customer reviews, comments and SpiderScribe reviews across a wide range of social media sites. The data is then presented in an easy to digest form showing how many people had positive and negative experience with SpiderScribe. With that information at hand you should be equipped to make an informed buying decision that you won’t regret. What are SpiderScribe pricing details? What integrations are available for SpiderScribe? SpiderScribe can seamlessly integrate with 5pm, a project management application also designed by Disarea LLC. If you need more information about SpiderScribe or you simply have a question let us know what you need and we’ll forward your request directly to the vendor.